Welcome to the hub for Peace and Justice in the Greater Lansing Area! 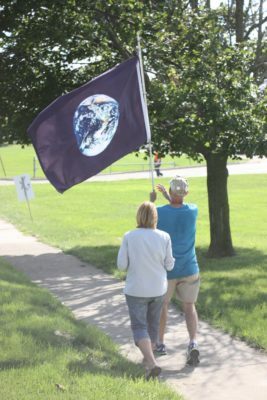 Just before Christmas the Peace Education Center, with the generous contributions of local supporters, bought space on twelve local digital billboards around Lansing and in Fowlerville and Jackson to push back against militarism. 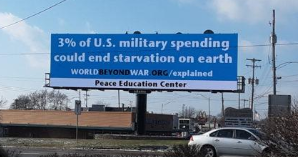 The message and design was provided by World Beyond War , an organization trying to get more communities to use billboards in order to awaken the citizenry to the futility of war and endless military spending. The billboard seen below (near Frandor Mall in Lansing, MI) will be up until late January when we hope to follow-up with another design to encourage the viewers to act. We will continue these efforts as long as we can develop the funding to support it. 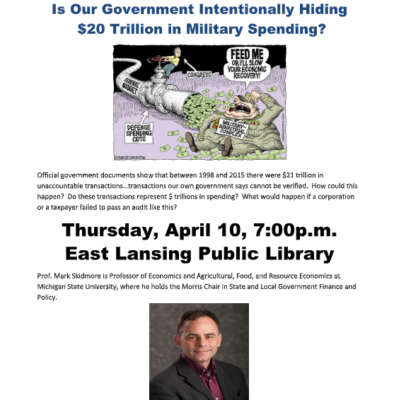 If you want to support this effort to educate our community please send checks with the notation “billboard campaign” to Peace Education Center, 1120 S. Harrison, East Lansing, MI 48823. Help us raise awareness to alternatives to violence and war! We’re turning 50! Read our latest blog post (below) to learn about how to contribute. Latest Newsletter : Fall 2018 – click below!